NYPD Detective John Shaft II is called in to investigate the racially motivated murder of Trey Howard, committed by Walter Wade, Jr., the son of a wealthy real estate tycoon. Shaft briefly meets a potential eyewitness to the murder, Diane Palmieri, but she disappears soon after and cannot be found for the trial. Wade is released on bail and flees to Switzerland. Two years later, Wade returns and Shaft rearrests him for leaving the country. During his temporary incarceration at police headquarters, Wade meets Peoples Hernandez, a Dominican drug lord. Wade relinquishes his passport and is released on bail again; in frustration Shaft resigns from the police force, promising to bring Wade to justice on his own terms. Worried that Shaft might find the missing eyewitness, Wade hires Peoples to find and kill her first. Shaft continues his search for Diane, enlisting the help of his friends Detective Carmen Vasquez and taxi driver Rasaan. While visiting Diane's uncooperative mother, Shaft and Carmen realize they are being followed by officers Jack Roselli and Jimmy Groves, who have been paid by Peoples to follow Shaft and get to Diane. Shaft finally finds her, but before they can talk, they are attacked by Peoples's men. In the shootout, Shaft kills Peoples's younger brother. Shaft, Diane, Rasaan, and Diane's brother manage to escape to Rasaan's apartment, but they are followed by Roselli and Groves. While at the apartment, Diane confesses that she saw the entire murder, and kept silent in return for a payoff from Wade's father. When Peoples arrives at the location, another shootout takes place. Roselli and Groves, outed as corrupt, are killed by Carmen. In a face-off between Shaft and Peoples, Peoples insinuates that he's been working for Wade, and Shaft kills him. Wade's trial finally arrives. Before it can begin, however, he is gunned down by Trey's mother, Carla Howard. In the police station, Shaft reiterates to Carmen that he prefers to be a private detective. A woman arrives, asking for Shaft to help her, claiming to have an abusive boyfriend. Shaft is initially reluctant, but when he sees her injury, he decides to help her anyway. Shaft, along with his uncle, John Shaft I and Rasaan, go together to confront the abusive boyfriend. Christian Bale as Walter Wade Jr.
Richard Roundtree as John Shaft I, the uncle of this film's Shaft, and the protagonist of the previous films. Philip Bosco as Walter Wade Sr.
On Rotten Tomatoes the film holds an approval rating of 67% based on 115 reviews, and an average rating of 6.1/10. The site's critical consensus reads, "With a charismatic lead, this new Shaft knows how to push the right buttons." On Metacritic, the film has a weighted average score of 50 out of 100, based on 33 critics, indicating "mixed or average reviews". Audiences polled by CinemaScore gave the film an average grade of "B+" on an A+ to F scale. The film opened at the box office at #1 with $21.7 million; by the end of its run, Shaft had grossed $70.3 million in the domestic box office and $107.2 million worldwide, against a $46 million budget. In 2000, McFarlane Toys released a Shaft (Samuel L. Jackson) action figure as part of their Movie Maniacs series three toy line. Accessories included are a handgun, sunglasses and a replica of the film's poster with a skulls and bones base. A soundtrack containing hip hop and R&B music was released on June 6, 2000 by LaFace Records. It peaked at #22 on the Billboard 200 and #3 on the Top R&B/Hip-Hop Albums. 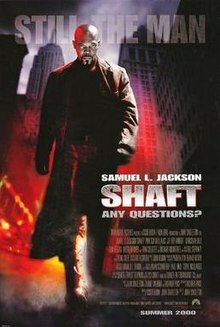 Despite having an identical title, the 2019 film Shaft acts as a sequel to both this 2000 film and the originals starring Richard Roundtree. The 2019 release stars Jessie Usher as John Shaft III, an FBI agent and the son of Samuel L. Jackson's character. Both Jackson and Roundtree reprise their roles as John Shaft II and John Shaft I, respectively. ^ D'Alessandro, Anthony (June 14, 2018). "'Superfly' Buzzes To $1.2M In Wednesday Opening". Deadline Hollywood. Penske Business Media. Retrieved June 14, 2018.